Pumped on Pulses: Feb. 10, 2019 is the first ever UN World Pulses Day, established by the Food and Agriculture Organization of the United Nations to recognize the importance of pulses as a global food. 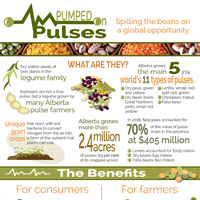 This infographic shares some of Alberta’s pulse facts and figures. The Future of Food: How Can Alberta Capitalize on its Strength in Agri-Food? Dr. David Hughes, emeritus professor of food marketing, spoke at two PPAA events — Nov. 26 in Calgary and Nov. 27 in Lethbridge — about global consumer trends, the plant-based foods segment, superfood snacks, customized diets, mindful choices and the business of cannabis. Plant-ingredient processing presents the type of opportunity that only comes once in a generation. But without industry and government making this a priority, the potential of the plant-based ingredient opportunity will be lost. The report recommends concrete steps to take so the Prairies can dominate the non-soy, plant-ingredient industry. The council believes the first step to prosperity is ensuring the right conditions are in place to promote growth in all areas in the Canadian economy. However, it also believes that certain sectors of the economy have significant untapped potential that will require focus and attention to unlock. In the second of three reports, the council uses agriculture and agri-food to illustrate how the government, in concert with the private sector, can take a targeted approach that would unleash the sector’s full potential. This is the first report of its kind that consolidates provincial and national views of Canada’s bio-economy. The provincial and national snapshots are meant to give both a granular and holistic viewpoint on a complex industry. Alberta snapshot pages 24-27.